At this point in the Facebook Marketing game, we know two things for sure: Facebook wants us to pay to reach audiences and small businesses still have neither the time nor the budget, to beat this system. 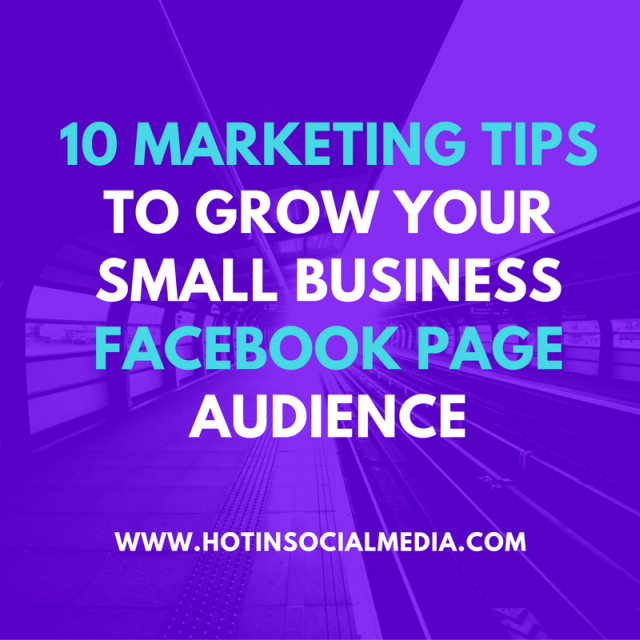 But fear not, there are still plenty of DIY tips and tricks to grow your small business Facebook Page audience. DON’T post when it tells you in your page analytics dashboard that most of your audience are online. That’s nearly always the same peak times for all business pages (6-9pm). Posting early in the morning or late at night can mean you are competing with less other brand posts to appear in news feeds and might actually increase your engagement rates. Less is definitely more now when it comes to Facebook content. So try to plan and organize content so that you only post once per day. Why? Because the more often page posts, the less feeds Facebook will put the second and third posts into, so as to not spam their users. Then, as engagement rates lower for each subsequent post, it will hurt your overall average score in the algorithm. For the same reason – Don’t post for the sake of it, or because you’re worried you’ve haven’t posted an update in a while. If you’re posting something overly promotional that isn’t that interesting or fun, it’s best to not bother, even if that means going a day or a few days with no content. Again, post with no interaction signals to Facebook that your content is not relevant and will have a detrimental impact on your ever-decreasing reach. By now we’ve all learned that these actually contravene Facebook’s own Terms and Conditions. However, small businesses will often still run competitions to increase page Likes. The problem for this business here is that you will achieve Likes from people who wouldn’t ordinarily want to be a fan of your content, just because they want to win a prize. You want to attract the right fans because if lots of people like your page but stop liking or commenting on your content, this will affect your overall popularity/usefulness score with Facebook, as above, and your organic reach will suffer. Now that we’ve got that out of the way, let’s get down to the serious (and no longer secret) guide to running your small business Facebook page. People tagging other users prompts Facebook to share the post on more news feeds because it likes to promote popular content. Either ask people to tag directly e.g. “Tag a friend who does this,” post things that ask a question like “choose A or B” or ask people to vote for a tutorial you will do, a giveaway you might run or comment on a celebrity news item/trend that is topical at the moment. Use free design tools, like the Canva app or similar, to turn your photos into eye-catching poster-type images with text overlays, speech bubbles etc. Adobe Spark also has a cool feature to help you create moving videos using slides of imagery, text and even sound overlays of your own voice recordings, making expensive-looking graphic design accessible to the masses. Facebook LOVES video and Facebook Live is the platform’s very own built-in I’ve streaming service. (Facebook has been busy trying to overtake YouTube for video users for the last few years). Unlike a normal post which will only reach 2-5% of your fan base, a video will be shared far and wide by Facebook, so try to use it where you can and tell your page fans in advance so they can learn to tune in. Popular live content includes Q&As, how-to videos or behind the scenes event footage. Encourage your customers to check-in when they’re with you if you have a physical office space, or your products are stocked in the store. Make a Wifi code obvious if you have one, perhaps on a sign reminding people to check-in. You could even offer to pick a monthly small prize winner for those who have checked-in or tagged your page in their posts on Facebook. Try your hand at Facebook ads. Pretty much all branded pages need to Boost Posts every now and again. This is because if your posts are consistently getting the low engagement of likes and comments, it will signal to Facebook that your content isn’t useful and Facebook will start to mark you down for it, showing your posts to fewer news feeds. So at least once a month, even a £5 boost on your best performing posts will improve your engagement score for the following month. Don’t forget to shout out others, especially other small businesses. As with all social media, networking is the key to it, and people like karma online. So telling people about your favorite YouTubers, local companies you support, cafes you’ve visited, etc. and tagging them not only increases your own page’s visibility but shows a good brand personality that is approachable enough for people to want to try your services. Fly-by-fans are people who have the potential to become committed fans of your Facebook page, but only happened across one of your posts (and liked it) perhaps because one of their friends was tagged in it, or commented on it, so Facebook put it into their news feed. An easy way to convert these people into Page fans is to click on the hyperlink of people who liked a post or picture (on a computer) and this will bring up a list of Facebook usernames. Beside each one that hasn’t liked your page will be an “Invite” button to send them a reminder to like your page. This will quickly grow your likes organically AND in among a genuinely interested audience. Keep repurposing your old content, particularly your most popular pieces. As your audience grows, don’t forget to remind them who you are and what you do, imagining that each month at least one or two people who see your posts are completely new to your page. And remind customers new and old about the great things you’ve done with Throwback posts and “on this day” memories of events, awards or business milestones. Look at the other types of content and pages your fans are interested in by using Facebook’s Search Function. Just type “pages liked by fans of *your small business*” into the search bar. Look at the specific posts on these popular pages (posts with the most likes, shares or comments). See what they have in common and then try to replicate their subjects or tone through your own posts. Content that takes people OFF Facebook is something Facebook hates (which makes most bloggers and websites hate Facebook!) So if you see an article you want to share with your fans, try where you can to save the photos from it and create a Facebook post that gives an overview of what you learned/liked. This way, you’ll get the engagement from your fans, whereas if you just post a link to a site with your comment above it, Facebook will show it to fewer fans, because it doesn’t want you directing people away. – Talk about your business: don’t just promote what you do, promote things related to what you do – things you know your fans will be interested in. Remember that your product or service is only one tiny element of the big, full life your ideal customer leads. – Try to come up with some kind of regularity to your schedule of content; as with TV in the old days – people like to know when to tune in for their favorite things. This is why you’ll see Facebook Live Sunday Night Q&As, get ready with me’s, new stock arrival posts, etc. Where possible, hit one of the two pillars of communications theory in the psychology behind sharing content: be useful or be entertaining. When you’re posting think how you can add value – could you give a tip about what you did for someone, share a piece of expert knowledge, tag a particular product they might like? Or can you make your content fun or themed, to link in with what people are already doing or talking about? Follow all these tips, and you’ll quickly catch-up with the big guns when it comes to rocking Facebook Marketing for your own small business! Leanne Ross is an Irish Digital PR and finalist in the Digital DNA Digital Newcomer of the Year 2015. Leanne is best-known for her popular blog on the Irish marketing industry and her Amazon Top 5 Bestselling PR book “Talk Is Cheap: The Digital PR Your Startup Needs (But Can’t Afford)”.